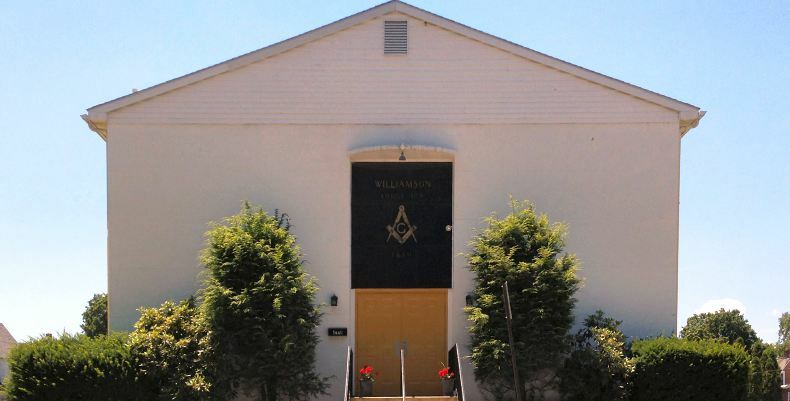 Welcome to Williamson Lodge, No. 309, F.&A.M. I am the past, the present, and the future. I belong to all ages. I am steeped in tradition and I thread the pages of history. I circle the globe and I stand at the crossroads of the world. I have rites and words that have beauty, sympathy, and rhythm. I place upon my pedestal the holy writ, and I turn to God in prayer. I have knowledge, wisdom, and secrets locked in my bosom, which I give to men who come desiring me in their hearts. I speculate with all the tools of operative masonry, and I translate their use into moral and spiritual building. I await free men of mature age, sound judgment, strict morals, and of good masonic report ... but I solicit none. Stated Meeting - 3rd Wednesday each Month, 7:30 PMPLEASE NOTE: The Lodge is "away from work" (no stated meeting) during the months of July and August.